It seems that I am unable to get away from the alleged Santa Rose UFO crash of 1963. I have additional information about the episode that Budd Hopkins reported in his "Deconstructing the Debunkers: A Response." Since this has become something of an important case, not for the information contained in it but because of the conflicting views about, I thought we’d take a last, final run at it. (For those who wish to begin at the beginning, please see my posting about Santa Rosa on February 7 of this year). I want to make one quick point that seems to have been lost, at least in my recital of the case. The Santa Rosa crash was originally discovered by two MUFON members identified by Hopkins as Brenda and Tom. They passed the case along, or rather, helped arrange for Hopkins to meet Beanie, currently the only known witness to the craft and bodies. We pick up the narrative at the point that Hopkins wrote, "Meanwhile my friend Robert Bigelow agreed to pay my way to Santa Rosa, and that of astronomer Walter Webb, to look further into the case, and I immediately took him up on the offer... She [Beanie, the woman who witnessed the UFO crash/retrieval] was a short, plump, feisty woman who, like me, had suffered from both polio and cancer, but she seemed to be truthful and quite intelligent, speaking in a charming, homespun, country argot. Later, when Webb arrived, we chatted about the case which seemed to him rather dubious; for many researchers, UFO crash-retrievals were - and still are - a hard sell. I was also aware that he was not informed about many aspects of the Beanie case of which I had become aware. Essentially Walt was an astronomer, not someone with extensive experience in working face to face with people like Beanie and I was right to be concerned." I had suggested, early on that Webb thought, that the Beanie case wasn’t worth further research when he learned the preliminary details. I was, of course, looking at this with hindsight and knew that Webb eventually came to believe that the case wasn’t an important one. He told me, however, "In the beginning we both [Hopkins and Webb] were impressed with what seemed like a consistent and somewhat logical story." This is, of course, in conflict with what Hopkins wrote. And I think today, and even a decade ago, the idea of UFO crashes was not a hard sell for many researchers. The Roswell case had changed attitudes and almost everyone was now open to the theory that something might have crashed somewhere at some point. The idea had, in the 1970s and the 1980s, been a hard sell, but by the mid-1990s, many of us were looking at these stories carefully thanks to the work of Len Stringfield and his 1978 MUFON Symposium paper outlining many crash cases that he thought deserved another look. But this is a matter of perception and who is to say that my perception is correct and that of Hopkins is wrong? Hopkins wrote, "In a rented car Walt, Beanie and I drove out to Santa Rosa and when we arrived at the house of the widow of the ambulance driver, I asked Walt to wait in the car for a few minutes until I came out and invited him in. I was afraid that two strangers 'from the East,' charging in together at an elderly woman's house, bearing a tape recorder and microphone, might seem a bit off-putting." I certainly understand this, especially if the way hasn’t been cleared. But then, the people must have expected something about why they were gathered there. The situation as described by Hopkins might be somewhat different. Rather than Hopkins and Beanie entering the house when they arrived, Beanie went in first, to get acquainted with her old friends while Hopkins and Webb left to eat supper at a local restaurant. This provided Beanie with the opportunity, and I stress this, opportunity to "coach" the witness. I’m not saying it happened, just that there was the opportunity. As they returned from their meal and pulled up to the house, the widow’s son, wife and children "trooped in from across the street and stood in the crowded room," according to what Webb told me. Webb speculated that there might have been some kind of signal to alert them or maybe they were just watching for the car to return. We now see that the situation, as described by Webb, suggests there had been some communication between Beanie and the widow and we weren’t going to see her facing the strangers from the east alone. Hopkins then, according to his own report said that he entered the house and was "... received politely by our hostess..." He talked with them for a while and then mentioned he had a colleague out in the car. He said that he made up some excuse for leaving Webb in the car and went out to get him. Webb then entered the house and set up his equipment. About Webb’s entrance, Hopkins wrote, "If Walter Webb had set off a small cherry bomb in the room he couldn't have caused more of a disruption." Webb told me that he brought in his tape recorder and that "Hopkins was aware that I had the device." It wouldn’t make a lot of sense for Hopkins not to know that Webb had planned to record the witness. The best way to take notes is with a recorder because you have the witnesses words right there. I don’t know how many times I have been accused to having misquoted a witness only to be able to prove, with the tape, that the witness said exactly what I reported he or she said. According to Webb, and his notes of the session, "It was only afterward that the informant [Beanie] said the recorder might have been a distraction." Webb said later that they had agreed from then on not to pull out recorders or cameras until everyone was comfortable with the situation. Here, however, there seemed to be a sense of urgency to document the widow’s tale as it would support Beanie’s story. Hopkins, as I noted in an earlier post, said that he returned later, in 1997, to conduct additional interviews and believed he was no longer a stranger to the family and developed a warm friendship with the witness. I have no doubt that this is true. Hopkins seems to be a very nice man, able to relate well to a variety of people, except, in my experience, those who might disagree with him. I found myself on the enemies list after the publication of The Abduction Enigma. No, I’m not surprised about that. I knew that the message of that book would not be one that those who embraced all of the alien abduction field would want to read. We, meaning Russ Estes, Bill Cone and I were suggesting that alien abduction was less about aliens than it was about researcher manipulation of the situation. We drew the parallels among alien abduction, Satan Ritual Abuse (SRA) and past life regression. But at the far end of the spectrum, I have had some very cordial email conversations with Hopkins... of course I was reviewing his book, Art, Life and UFOs. Draw your own conclusions. The point is, however, that Hopkins continued his investigation of the Santa Rosa crash/retrieval without the help of Walter Webb. As I explained in the earlier post, he gathered more information from Beanie but was unable to find any substantial corroboration for her tale. Hopkins suggests there would be no reason for the government, or in this case "the Air Force to have gone to the ambulance and removed everything from the rear area – the sheets, various pieces of portable equipment and so on." And there is no proof that this ever happened. All we know is that the widow seemed to corroborate that and the operative word here is "seemed." Carol Rainey, in her article about Hopkins had reported that there had been a long list of possible witnesses to the case. In rebuttal, Hopkins wrote, "The first time I visited Santa Rosa, Beanie and I made a long drive to another town some distance away. She thought that a certain young trooper just may have been the officer in the second car that day, and through Tom [another trooper] we learned his address. I suggested that we not call the man in advance, that we just show up to take anyone there by surprise and thereby get a thoroughly unrehearsed account. [An ambush with recorders and cameras?] So we drove and drove, endlessly it seemed [which, given this is New Mexico, isn’t all that much of a surprise], and when we arrived, the ex-trooper's divorced wife was home and told us that her husband had moved out years ago and she had lost contact with him, though she recalled that he was possibly working for a security company in the far east somewhere. That was that, and I only mention this abortive trip because my ex put it this way: "Neither she [Beanie] or Budd had tracked down or spoken to any of the long list of witnesses." [Emphasis is Hopkins’] I wish we had had even a short list of witnesses from this thirty-year-old incident, but we didn't, so apparently the helpful Ms. Rainey invented such a list for us, but then scorns us for not trying to find them." But Webb suggests that there had been a long list of possible witnesses and other informants that he had supplied to both Hopkins and Beanie. According to him, neither acted on the list, meaning that no one attempted to find any of those people. And yes, I have seen the list. These included some relatives of Beanie who might have heard her talk about the crash in earlier years, people at the hospital who might have been involved in some fashion, and others who could have had some knowledge... not that they necessarily did, but the questions that should have been asked never were. There were names connected with each of Webb’s suggestions. Yes, I know from my own experience that sometimes the importance of a witness gets jumbled in the telling. I had once been told of an Air Force officer who had flown President Kennedy in Air Force One to see the Roswell alien bodies. When I finally located the officer I learned that he had been an alternate pilot on Air Force One, had flown with President Kennedy on board and that he, the pilot, had seen a UFO with an alien pilot visible. So the lead, which was supposed to confirm the alien bodies in storage story turned into something else. But it was a lead that had to be followed. Hopkins wrote, "She [Rainey] quotes from an early letter from Walt Webb in which he berates Beanie for reporting some details about her initial experience which vary, one from one another." But that’s not quite accurate. Webb said that he berated no one but had questioned Hopkins about some of the conflicting details that had emerged as he learned more about the case. Not embellishments, or additions to the story that could be memories that she had just accessed. Webb also pointed out that he was unaware of the changes when he traveled to New Mexico with Hopkins, and that when he wrote to Beanie, he hadn’t yet seen the transcript of the first interview. Webb’s letter to Hopkins was talking about changes in the story from the time that the MUFON representatives questioned Beanie and when Hopkins and Webb arrived on the scene. It wasn’t about embellishment. It was about contradictory information. In fact, the one that caught my eye was that in the first interview, conducted by MUFON members in Albuquerque, Beanie said there were two bodies, one outside the craft and one partially out. She told Hopkins and Webb that there had been three bodies, all outside. Not the sort of detail that you would expect to change so significantly. Here is something else to ponder. We now have information about the Santa Rosa UFO crash from three sources. You might say that two of those sources, Rainey and Hopkins have an interest in the way the story is perceived. I would say that Webb is a disinterested third party except that Hopkins called Webb’s investigatory skills, his experience working with potential abductees, and his motives in the case into question as a way to distract attention from the real weaknesses of the case. The only person we haven’t heard from at this point is Beanie. I know what the various researchers will say. I know what the details are and have heard those details from three separate directions. But I also know that there is simply nothing to support this tale. It is, in the end, single witness, and it doesn’t matter if you believe Rainey’s, Hopkins’ or Webb’s version. They all agree that it is single witness... No, the widow and her son didn’t see anything themselves. At best they heard about something strange and the son does seem to mention "alien bodies," but he didn’t see them. Worse still, the son’s memory might have nothing to do with the Santa Rosa crash. Now I believe we all have enough information to make an intelligent determination about the case and the controversy that has erupted around it. Is this a good sighting, based on the story of an admittedly likeable woman? Does the lack of corroborative detail, other than some vaguely remembered events that might or might not be relevant suggest there is something of value here? Or have we found ourselves in another of Ufology’s turf wars where the cult of personality is more important than finding our way to the truth? The answers to those questions are, at least to me, obvious. There was no Santa Rosa UFO crash and unless, or until, some kind of corroborative detail is found, this is just another footnote to what is becoming a long and overblown list of UFO crashes. And that is all is should be. I have been very reluctant to enter this fight because I have great empathy for Budd Hopkins who is very ill. I had empathy for Phil Klass when he was ill. But I disagree with many of the conclusions that both men drew based on their research techniques. But as Lee said at Gettysburg, "The enemy is here. I did not want this fight, but the fight is here." So, with reluctance, I enter the fight because I don’t like the way part of it has been conducted. I read Carol Rainey’s article and am aware of the old adage that the true test of another’s intelligence is how much he or she agrees with you. I have thought, based on my investigations, my research, and my discussions with many others, that the answers for alien abduction did not lie in the stars, but here on Earth. I found terrestrial explanations that were far more satisfying than a group of aliens abducting humans to perform genetic experiments that would have been crude a half century ago. And now I have read Hopkins’ response ("Deconstructing the Debunkers: A Response,") to Rainey’s article and found it to more in line with a smear and less with a discussion of the scientific merit the abduction phenomenon. He reduced the discussion to his beliefs in UFO debunking, erecting strawmen to knock down but providing little in the way of objective evidence for his point of view. He suggested that Rainey, and others he labels as debunkers, believe that nearly all abductees are liars who are participating in elaborate hoaxes, though I saw nothing in Rainey’s article to suggest that. Hopkins explains the complexity of attempting to keep all the lies straight during convoluted investigations, but never mentions that these alleged liars have the assistance of the researchers to help them keep the story consistent and in developing corroborative details. Just look at the transcripts as published in the various books by abduction researchers. You see the same questions asked again and again until the correct answer is supplied... and often those old mistakes in the story are ignored and forgotten. In other words, it is the researcher who is supplying much of that corroborative detail, helping to keep the complex story straight and selecting only those parts that confirm their preconceived notions. John Mack mentioned during a video taped interview with Russ Estes (which I mention here only because abduction researchers often claim that we had never interviewed them), that he found a curious matching of researcher and abductee. Let me explain. In C.D.B. Bryan’s book about the MIT Abduction conference (Close Encounters of the Fourth Kind, 270 – 271), Bryan quoted Mack as saying, "And there’s another dimension to this, which Budd Hopkins and Dave Jacobs and I argue about all the time which is I’m struck by the fact that there seems to be a kind of matching of the investigator with the experiencer. So what may be the archetypal structure of an abduction to Dave Jacobs may not be the uniform experience of, say, Joe Nyman or John Mack or someone else. And the experiencers seem to pick out the investigator who will fit their experience." He then adds, after agreeing he might have that backwards, that "It seems to me that Jacobs, Hopkins, and Nyman [another abduction researcher] may pull out of their experiencers what they want to see." And right there we have the indictment that there is implantation of the researchers belief structures on those claiming alien abduction. For some reason Mack doesn’t see that he had just explained why there is an agreement from abductee to abductee in a researcher’s investigations and an agreement with a particular investigator’s belief structure. He or she is pulling out what they want to see. That suggests that the abductees are not liars. Sure, we can point to a couple of cases in which it eventually became clear that the witness was being less than honest. After I had reported on the Susan Ramstead case, I had an opportunity to review the evidence with her and soon learned that she had been making it all up. She had read the necessary books on abduction so that she knew what to say and how to say it. She was the exception though. Few people who claim abduction are lying about the experience. It is more likely that they have had some sort of an experience and through their own research or their contacts with abduction researchers come to believe that aliens are involved. Nowhere has any of us suggested that the majority of abductees are liars. In fact I argued the point with Philip Klass. He wanted the abductees to take lie detector tests. I said it would do no good because the majority believed what they were saying. Didn’t mean it was grounded in reality, only that they believed they were telling the truth. As noted, Mack understood this and he recognized that there was an implantation of ideas by the researcher. Maybe it is time to mention Richard Boylan who had two clients come to him who believed they had been ritually abused by Satan worshipers. They came to him confused and when they left, there were even more confused because Boylan told them that Satanists were not responsible... it was alien creatures. Here is a blatant example of the abduction researcher implanting his own belief structure on his clients. So none of us are saying that all the abductees are lying, as Hopkins repeats in his attack. Mistaken... led... duped... hypnotized, but not lying. We realize that there is often some sort of a precipitating incident. In many cases this is sleep paralysis. The real point is that the symptoms of sleep paralysis mirror those of alien abduction and no one, in the last decade and a half, since we raised the issue, has attempted to develop a protocol that separates cases of sleep paralysis from alien abduction. Kathleen Marden did tell me that abductees report the events in color but victims of sleep paralysis report the case in black and white. If true, meaning, if confirmed, then we are making progress. But I don’t want to argue the merits of sleep paralysis versus the possibility of alien abduction. Instead I want to look at Hopkins’ attack and where it slipped off the rails. That would be in his recitation of the Santa Rosa crash/retrieval. I will say that if nothing else, we now have a great deal of additional information about this event, and anything that does that can’t be all bad. I will also note that with much gnashing of teeth we are still left with a single witness case that has no corroborating information and that makes it very weak. Hopkins makes it clear that the only real witness is likeable woman he called Beanie, though there were hints to other witnesses. She mentions the name of the state trooper who was on the scene. He might have been the man who covered the alien bodies with sheets but he was certainly there to witness part of this. He would be a wonderful corroborative witness because he was a state trooper, well known to Beanie. He was a man called, "Dutch." Hopkins wrote, "This detail was, of course, extremely important, because the last person a hoaxer wants to locate is a ‘designated witness’ who says, ‘I don’t know what you’re talking about. What incident?’"
And that sounds very good and logical, except it isn’t necessarily true. Gerald Anderson who, as a five-year-old child, said he had seen the crashed alien ship and the bodies of the flight crew on the Plains of San Agustin and even provided the name of one of the witnesses. He said that Adrian Buskirk was the archaeologist who had been there. The name was actually Winfred Buskirk who was clearly the man Anderson described and who was, in fact, alive, to say that he wasn’t there. He had been on the Apache Indian reservation during the summer of 1947 and even had pictures to prove it. So, was Anderson’s tale rejected? No, Buskirk was labeled a liar and a government agent of some sort. Anderson’s discredited tale is still believed even after he admitted to forging documents and after Buskirk refuted his claims. Hopkins noted that hoaxers "of anything, when the subject of possible witnesses arises, will say something like, ‘I don’t remember him exactly but I think he might have had... blonde hair... I don’t remember his name.’"
And yet when Robert Willingham was inventing his tale of a crashed UFO, named many names. Now, it is true that every name he supplied turned out to be a dead friend, but it also gave us a place to begin looking for corroboration. So, despite Hopkin’s stark claim, this is not borne out by other cases. What disturbed me most about this new data on Santa Rosa was Hopkins’ attack on Walter Webb. For those who don’t know, Webb has been investigating abduction cases before Budd Hopkins even believed that UFOs were extraterrestrial. But Hopkins dismisses Webb, writing, "Essentially Walt was an astronomer, not someone with extensive experience in working face to face with people like Beanie and I was right to be concerned." He then goes on to say, "He [Webb] came in quickly [to a house where there were addition witnesses], bearing his equipment, and immediately asked the widow for a table so that he could put his instrument in the center of what he hastily improvised as a kind of circle so that he could record everyone. Since I had not yet mentioned tape recording any of the family, or asked permission, one can imagine the family’s shocked response." Hopkins then reports, "If Walter Webb had set off a small cherry bomb in the room he couldn’t have caused more of a disruption." The interview in question was with the widow of the ambulance driver and not the widow of the recently deceased state trooper. Careful reading of Hopkins’ "Response," makes that clear. So this is a woman who had no direct knowledge of the UFO crash or the recovery of the bodies. In other words, a second-hand witness at best. Jerry (Jerome) Clark, in his massive The UFO Encyclopedia of UFOs (2nd Edition) wrote about Walter Webb. "One of ufology’s most respected investigators... Webb spent 32 years of his working life at the Charles Hayden Planetarium at Boston’s Museum of Science as a senior lecturer, assistant director and operations manager... As a scientific advisor to the National Investigations Committee on Aerial Phenomena (NICAP), Webb investigated the classic Hill abduction case..."
This doesn’t sound like a guy who has no people skills and who just bursts into a room setting up equipment without a thought about the impact of that on those already in the room. Why would Hopkins make any such claims? Could it be that Webb suggested that the Beanie case was not one worth further research? That it was single witness with no corroboration? I’ll note something else that struck me here. Hopkins wrote that they had visited with the widow and developed a warm relationship. He, with Beanie, visited her to talk about the possible UFO crash. According to Hopkins, this mystery woman (I say this only because Hopkins provides no name... and given the way some people do operate in the UFO field, he is probably justified in sparing her some of those communications), said that she had done all the paperwork for the local ambulance that would include the trip tickets and billing. She explained to Hopkins that on this visit to Santa Rosa they were never paid to pick up the bodies and "what’s more, she recalled that her trip book had a number of consecutive pages missing around the same time." Great. The documentation is conveniently missing. But I see nothing to suggest that Hopkins asked to see that trip book or attempt to verify the information. The trip book with the missing pages would, after a fashion, provide some corroboration for the tale. Yes, I know that people lose paperwork and this would have been nearly fifty years ago... but as near as I can tell, he never asked about it. What all this tells me is that there is but a single witness here. The ambulance driver’s widow suggests there is missing paperwork from the time frame but nothing that actually proves this. The trooper is dead and his brother, who was a sheriff, never heard the story. There is absolutely nothing except the tale told by Beanie and the vague memories of the widow who was not involved. So, the only defense of this rather poor crash/retrieval story is an attack on Walter Webb because it is clear that Rainey’s reporting of Webb’s attitudes is accurate. I verified this with Webb, who told me that it was "essentially correct." Rather than providing us with a coherent response that includes evidence that can be verified by others, Hopkins, instead, labels Rainey as a debunker who has fixed opinions and no amount of evidence will sway her opinion. In reality, Hopkins offers no evidence that alien abduction is real but more of the same anecdotal evidence that has failed to convince science that here is something that demands further research. All attempts to provide the physical evidence has failed to this point. There is always some reason why it can’t be offered or why it has disappeared. When challenged, the abduction researchers retreat to a line suggesting that they have interviewed hundreds of witnesses, conducted hundreds of investigations including dozens of hypnotic regression sessions. They tell us that hypnotic regression is a solid research tool but the majority of the scientific evidence refutes this. Hypnosis might be a valuable therapeutic tool, but is not useful in gathering evidence. There are simply too many ways to lead the subject. In fact, as Russ Estes, Bill Cone and I suggested more than a decade and a half ago, we need to move beyond the case studies in abduction research. We need to gather some useful evidence that can be analyzed but every attempt to provide that additional evidence has failed. The implants cannot be proven to be of alien manufacture. The electronic surveillance always fails for a variety of reasons. The photographs don’t turn out. The DNA analysis is either never attempted or fails to provide the corroboration. All we have, in the end, are the stories told by those claiming abduction and those attempting to investigate it. Hopkins, unable to prove that alien abduction is real, or that he has solid evidence to prove his case must show that Rainey is wrong in her various assertions and attacks her as a debunker. Hopkins knows, just as anyone around this field knows, that labeling someone a debunker is a quick way to refute what he or she says without having to provide evidence that he or she is wrong. If a debunker said it, then it must not be true. The title of his paper, "Deconstructing the Debunkers: A Response," tells us all we really need to know about the paper. Hopkins isn’t going to deal with the issues raised by Rainey in her article, or by others who have preceded her. He is going use the debunker brush to smear her arguments so he doesn’t have to answer them. Going back to the Santa Rosa crash, Hopkins wrote, "In her paper she dismisses the [ambulance driver’s] widow’s testimony in this way: ‘When pressed, she seemed to vaguely recall that the Air Force had indeed once stripped the ambulance clean and taken the billable trip ticket, as Beanie claimed.’ Ms. Rainey is good with adverbs: note the word ‘vaguely.’ But she also wields verbs as well: ‘when pressed’ I assume that what she is trying to get across is the idea that since she believes there was never an Air Force visit to the ambulance and no missing trip ticket, (facts Beanie had only learned from the widow) she is claiming that Beanie somehow forced the old lady to join her hoax by accepting her – Beanie’s – lies and then passing them on to me." But, of course this analysis is not accurate. I’m not sure how you prove that the trip ticket is missing, but that isn’t a fact. There is no evidence that the Air Force stripped the ambulance. And under close questioning, asking about missing trip tickets may certainly produce a positive response but doesn’t prove the Air Force was responsible or that alien bodies were involved. Hopkins then defends the use of hypnosis and challenges the rest of us to "...go back to my books if you wish, and good luck in finding any mistakes or leading moments you’d like to quote against me." First, let’s look at an interview conducted by Jerry Clark, editor of the CUFOS International UFO Reporter ("Conversations with Budd Hopkins," Nov/Dec 1988, 4 – 12). Hopkins told Clark, "The first point is, of course, that we have 20 to 30 percent of the abduction accounts recalled without resort to hypnosis." Clark was pursuing the idea that hypnosis could lead to confabulation, suggesting that abduction reports were similar to past life regressions in that they both emerged under hypnosis. The subject, for example, entered into the session believing in past life and under hypnosis, told of a past life that was rich in detail. Hopkins told Clark, "A person enters a past-life regression out of a desire to believe in reincarnation. He's entered a situation - allowed himself to be hypnotized - for that reason alone." Yet in reading what Hopkins wrote about Steve Kilburn in Missing Time, we find the same thing is true. The whole investigation of Kilburn's experience came out of UFO research. Ted Bloecher brought him around because of his fear of the stretch of highway, but Hopkins had noted the "pattern" of victims being taken from deserted highways. During the discussion that preceded the hypnosis, Kilburn said, "It was a very dark road, that was for sure, and it did occur to me as I was driving that this is the kind of place that something like that (a UFO encounter) should happen." What that says, simply, is that Kilburn had entered the situation, expecting some sort of a UFO encounter. They had discussed it before the hypnosis began. And they found a UFO event. This was a point that seemed to be lost on Hopkins, though he had already demonstrated that he understood it when he was describing the past life regression therapy. Hopkins in that same interview with Clark, also said that stories of reincarnation are pleasant, but tales of alien abduction are "at least unpleasant and sometimes horrifying, something where the person has every reason to feel terrified, humiliated and upset about the whole experience. Who would want something like that? Yet the stories emerge nonetheless." Hopkins is suggesting that the tales must be true because the victims of alien abduction would not make up horrifying tales. They must be true, because, as John Mack has said repeatedly, "This is not a club that anyone would want to join." But these arguments are based on the logic of those making them. There is no evidence that such is the case. When the victim appears at the therapist's office, or at Hopkins' group meetings, he or she expects to find an alien abduction and they do. The relative pleasantness of the experiences is irrelevant to those telling them. And the parallel to reincarnation can be drawn even further. Although Hopkins suggests the tales of reincarnation are pleasant, often they are not. In one case, a woman afraid of the water learned during a hypnotic probing of a past life that she had been killed by an alligator as she jumped into a river. Hopkins has spent the years since the Kilburn case interviewing others who claim abduction. During the Clark interview, he pointed out that he had a number of psychiatrists, psychologists and psychotherapists who had come to him to explore segments of missing time with hypnosis. If these people, and their clients, aren't already "programmed" to believe in an abduction, then why search out Hopkins for assistance? Wouldn't anyone versed in hypnosis be able to help them learn what happened during this supposed missing time? Aren't each of them "primed" for an abduction, just as those who go to a reincarnation specialist are "primed" for learning about a past life. Even that testimony in these sessions is somewhat contradictory. In Hopkins' own work there is evidence that the subjects do not easily accept the notion of abduction. Hopkins reports the tale of a man he called Philip Osborne. Hopkins wrote, "I noticed his interest in the subject had a particular edge to it. It was almost as if he accepted too much, too easily." Hopkins believed "that someone with a hidden traumatic UFO experience might later on be unconsciously drawn to the subject." Osborne called Hopkins after an NBC UFO documentary and said that he had been struck by Kilburn's remark that anyone could be the victim of abduction. Osborne had been searching his memory for anything in his past that would indicate some sort of strange experience. Then, one night after the NBC program, Osborne awoke in the middle the night, paralyzed. He could not move, turn his head or call for help. The experience was over quickly, but it reminded him of another, similar event that happened while he was in college. That earlier event had one other, important addition. He felt a presence in the room with him. Hopkins, along with others, met Osborne a few days later to explore these events using hypnosis. During the initial hypnotic regression, Osborne gave only a few answers that seemed to direct them toward an abduction experience. According to Hopkins, Osborne told them that he "had more or less refused to describe imagery or events that seemed 'too pat,' too close to what he and we might have expected in a UFO encounter." During the discussion after the hypnosis, Osborne told Hopkins that "I would see something and I would say to myself in effect, 'Well, that's what I'm supposed to see.'" And, in a second hypnotic regression session held a few days later, while under hypnosis, Osborne said, "I'm not sure I see it... I think it's my imagination... It's gone now." Osborne, it seems, had recognized one of the problems with abduction research, had communicated it to Hopkins, and then had it ignored. Osborne was wondering if the "memories" he was seeing under hypnosis were real. Hopkins believed they were so took no notice of Osborne's concern. Hopkins, as he noted in his response to Rainey, believes in the reliability of hypnosis as a method for uncovering the truth. I, however, see those statements by Osborne as extremely important in attempting to understand alien abduction. Osborne's initial experiences are also classic forms of sleep paralysis. Even the belief that an entity is in the room happens in about eighty percent of the cases of sleep paralysis. This simple explanation is all too often ignored by UFO researchers. The point, I think is made. Here were Hopkins own words, from one of this books, telling us a story that Hopkins refused to hear. Both these examples seem to suggest leading the witness to the point where a fear of a stretch of highway, and an episode of sleep paralysis turns into an alien abduction and there is just no physical evidence to take us there. Just the hypnosis used to question the witnesses about their experiences. So, here’s the dirty little secret about abduction research. All the evidence is anecdotal. There is no real physical evidence. Oh sure, they talk of implants, but when those have been removed and analyzed, there is nothing to suggest an extraterrestrial technology. As Hopkins said, this has now gone on much longer than I intended. However, I wanted to address issues raised in his response, and I hope I did it without calling into question his personal integrity or motives the way he went after Carol Rainey and even Walter Webb. What all this tells me is that after a decade and a half, others are beginning to raise the issues that Estes, Cone and I did in The Abduction Enigma. I think it’s about time, and I sincerely hope that the discussion can say on a level of reviewing the evidence, or lack thereof, rather than descending into the cult of personality as it too often does. We have a chance here. Let’s not let it get away. Again. You need to click on the picture of the UFO and then on the English translation to read the whole story of the investigation of the pictures and the evidence they present. You probably should also be aware that the picture on the home page rotates among several so you need click on the proper one. The upshot of the article, written by Alexandre de Carvalho Borges and translated by Eduardo Rado and Thiago Ticchetti, is that the pictures of the Saturn-shaped UFO are a composite created by Almiro Barauna and not of a craft from another world. 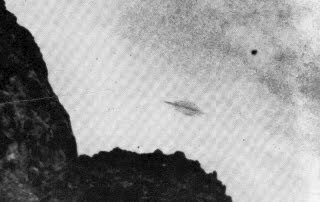 Back on January 1, 1958, a photographer on the Brazilian ship, Almirante Saldanha, took four pictures of a "Saturn-shaped" object as flew over the island of Trindade off the coast of Brazil. Almiro Barauna developed the film about an hour later. He and Captain Viegas entered the ship’s darkroom together. After developing the negatives, Barauna at first, thought that no image had been picked up, but Viegas, looking carefully, spotted the UFO. What brings all this up is that a Brazilian TV network, Fantastico, just broadcast a story that suggests, finally, an answer about authenticity of the pictures has been found. According to Fantastico, "This Sunday (August 15), for the first time Fantastico reveals the truth about the Trindade Island UFO. A friend of the family told what she heard from the photographer himself [Almiro Barauna] he had hoaxed the images, it was a montage. ‘He got two kitchen spoons, joined them and improvised a spaceship, using as a background his fridge. He photographed the fridge door with the object in perfect illumination. He laughed a lot about it,’ revealed Emilia Bittencourt. Barauna’s files are in possession of his niece, who didn’t want to record an interview, but confirms the hoax." Now we have more of that evidence thanks to UFO Brazil and Carvalho Borges. The new information comes from the nephew of Barauna, Marcelo Ribeiro, who said he kept the secret for fifty-three years. According to him, the photographs are faked. Asked what is the truth about the pictures, Ribeiro said that they are not true because there was no flying saucer. He asks, "If there had been one, wouldn’t some of the others on the ship have taken pictures of it?" Strangely, he then refutes the tale from Fantastico TV, saying that Emilia Bittencourt had told nothing but lies. She knew nothing about the pictures or how they were created. Ribeiro said that the people on the boat did see something but that it was a strange cloud formation or something else natural. He said that his uncle, who had been taking pictures underwater when the object was first seen, climbed onto the boat but had no unexposed film in his camera. Figuring out that he could make money, he pretended that he took a number of pictures before returning to his cabin for another roll of film. When he returned, there was nothing in the sky but he took several pictures anyway. Ribeiro makes it clear that there was something in the sky, but it wasn’t a spaceship. Ribeiro doesn’t believe in alien visitation because they would be billions and billions of light years away. I mention this only because it is so wrong. The closest star is only 4 light years away and there are many, many stars within fifty lights... which is not to say that travel among them is possible, only that it is more likely than dealing with another galaxy a billion light years away. Anyway, Ribeiro claims that his uncle, once he had taken pictures of the landscape, developed them on the ship on the orders of the ship’s captain. He had no photographic paper and showed the captain the wet negatives. Ribeiro suggested that by pointing to certain areas on the negatives, his uncle was able to convince others including the captain that the object was there when it was only some artifact in the clouds. I do know that it is difficult to identify things on a photographic negative and I know that if you point to something and suggest it is an object, many people will agree with you. I don’t know how successful this might be in the circumstances described here. But now we move into an area that suggests that the photographer was able to think ahead... or an area that suggests this latest explanation falls short. According to Ribeiro his uncle realized the commercial value of a high quality photograph of a UFO and knowing that set the stage while on the ship. He knew that he would make money. Once the ship returned to port, Ribeiro’s uncle, Barauna, left, taking with him, the negatives he had shot. At home, in his studio (or laboratory as they suggest in the article) he experimented with various objects until he settled on bus tokens. He photographed them against a black background and then printed his pictures with one negative and then another creating a composite that held both the ground details and the UFO. At this point I suppose I should mention that Barauna had, in the past, done an article about the creation of UFO photographs. He was a skilled technician, some might say an artist with a camera, and creating the composite and then a negative from that wouldn’t have been difficult for him. Done properly, no one would be able to tell that the composite print and negative made from it were a double exposure, at least according to Ribeiro. The print would look just like, well, the photographs that we’re all familiar with. Now comes the rest of the story. Ribeiro said that Barauna shared the story with him but didn’t want him to tell anyone because he would be "demoralized" which might be a poor translation. It probably should be discredited. At any rate Barauna didn’t want his nephew to say anything until after he was gone. So now, with his uncle safely buried, Ribeiro is saying that the pictures were faked for the money they would make. It was sort of a spur of the moment plan conceived on the ship as the crew and others were standing around thinking they had seen the Saturn-shaped object. The article’s author, Alexandre de Carvalho Borges, said that in 2003, he had called Barauna,s friend, Amilcar Vieira, who had been on the ship and asked about it. Vieira said that he had seen the object. Ribeiro agreed that Vieira had seen something, some object, just not the thing in the photographs and certainly not a craft from another world. Ribeiro suggested that if others were standing around, pointing at the object in the sky, that strange cloud formation or natural phenomena, Vieira would have seen it too. That’s just human nature. It is the interpretation of the object that is in question here... and, of course, the real shape of it. I asked both Jerry Clark and Brad Sparks what they thought of the newest information. Both had studied the case in the past. Jerry (Jerome) Clark detailed the case in the second edition of his classic The UFO Encyclopedia, wrote, "The latest developments, like the ones last year, look pretty questionable, with some very serious problems coming out of the gate. Sparks wrote, "All I would say is that the double exposure theory is rubbish and a violation of the basic physics of photography. A double exposure cannot possibly take away light from an image, it can only add to it (a "double" exposure is the taking of two pictures on the same frame of film without advancing the frame). Yet, parts of the UFO image are darker than the sky, which is not possible for a double exposure. If the fake UFO is photographed over the sky-and-Trindade island background then no part of the UFO image can be darker than the sky onto which the fake UFO is filmed." And both of them suggested that I contact Martin Slough for his opinions on the case. Slough had been studying the case in depth for many years and had been one of the first to suggest that we not take the new information at face value without some further research. I should perhaps add that the possibility ...that Ribeiro is [blending] memories of various discussions related to the several "trick shots" which everyone knows Barauna was involved with. Ribeiro mentions the Mundo Illustrado photos and the Carioca fleet bus tokens, making an explicit connection to what he remembers Barauna telling him re[garding] the Trindade case... We know Barauna must have been often asked 'Did you fake it?' and 'How did you fake it?' or 'If you had faked it, how would you have done it?' - the latter being the question that the Navy technicians astutely asked him in 1958. Ribeiro no doubt correctly characterises Barauna as a great talker and a joker who loved to hold forth, and he must have talked about his escapades many times. ...Of course he may have told Ribeiro that he faked them. Ribeiro may have added some confusion to the core of a true memory. But given the inconsistencies in the story I'm afraid we have to place it in the category of questionable hearsay. Sadly no amount of questioning of Ribeiro now is likely to encourage him to reflect on the story he has made so public, and the witnesses he says he could have added in his support are unfortunately dead. It's a shame he didn't produce this story years ago. I'm not sure it is true that microscopic examination of grain structure would fail to spot [douible exposure]. The double exposure doubles the numerical grain density in the region of the UFO on the final fake negative. It may be difficult to spot this doubling, given that the background is not very emphatic and of course the grain structure is a fuzzy, flocculent mess that's difficult to quantify, but it is not the case that there is just no possible physical trace of the operation in the grain structure, as Ribeiro seems to suggest. There could be a detectable trace and the Navy people might have looked for it. I would like to see this tested. And there is something here that Martin, Clark and Sparks didn’t address and that is Ribeiro’s story is second hand. We are warned, repeatedly, about the value, or lack of value, of second-hand testimony. It is often flawed, misunderstood, and many times impossible to corroborate. Here we have a story told by the nephew of the original photographer about how the Trindade Island photographs has been faked, but we don’t have the same sort of confession by the original photographer. All three of them said that we shouldn’t accept this new claim as authentic without some kind of corroboration... just as we shouldn’t accept a UFO claim as authentic without the supporting evidence. I will note here that over the years many of those who took pictures of UFOs have come forward to tell us that they faked them. Some of those were teenagers when they did it and a few were young adults, but the point is that they did confess. With the Trindade Island photos we have no such confession except for the uncorroborated claims of a nephew... and interestingly, those of Bittencourt, who he says was lying about it. It seems to me, given all this that we don’t have a real solution. We have some uncorroborated testimony from the nephew of the man, but we don’t have anything like that from the photographer himself. Barauna said, repeatedly, that the pictures were authentic... except, allegedly, to a couple of family members. I had hoped, with this latest revelation, we would come closer to a solution for this case but that hasn’t happened. We still don’t know if the object photographed was real, was alien, or a trick whipped up in a photo lab. I’m afraid it just might remain that way. Since the publication of Crash - When UFOs Fall from the Sky, I have learned more about some of the cases mentioned. One of those, which I only reported in the Epilogue was from Santa Rosa, New Mexico and involved a hospital employee. The Santa Rosa story by a medical technician who told of an emergency call that took her and an ambulance driver some 18 miles from town is a case in point. She told researchers that when they reached the two police cars blocking the road, she and the driver got out of the ambulance to talk to one of the State Troopers. They saw three small bodies on the ground. The nurse thought immediately of children and asked about parents, but was told there weren’t any parents. She did see some wreckage, enough to suggest two cars might have collied, but she couldn’t identify the type of cars. The little bodies were only 3 to 3 1/2 feet tall and had been burned. They were oozing a brownish fluid. One of the bodies had an arm that was broken or damaged in some way. She could find no vital signs, but they put them into the ambulance to return to town anyway. At the hospital, she took x-rays of all three. About an hour after they reached the hospital, the Air Force arrived and she said an officer, who she thought was a colonel, ordered everything removed, including the x-rays and any notes she had. She also saw that the Air Force had a flatbed truck with something covered by a tarp. Once the Air Force had everything gathered up, they drove off. According to Ryan Wood’s Majic Eyes Only, she had never mentioned the crash because she had been warned that the government had "a long arm." She was never to speak of this. And she didn’t talk about it until she saw pictures of hungry children in Somalia. She thought they looked like the little bodies that had been recovered, meaning the strangely shaped bodies and the overly large appearing heads look something like the starving children. I suspected that the case was mostly invention because it was single witness and the reactions of the people involved, according to the story, just didn’t ring true to me. And I haven’t even mentioned that the Air Force would have had no authority to confiscate the hospital records, or that I would have thought that those at the hospital would think to hide some evidence. Surely someone would have had the foresight to keep some of the documentation on something so extraordinary. Then I read an account of the case from Carol Rainey who had been married to Budd Hopkins. She was there, during the 1990s, participating in and documenting his research into alien abduction. It was Budd who stumbled across the Santa Rosa case in 1995 though Rainey’s involvement wouldn’t begin until 1997. http://tiny.cc/2pzis., Budd investigated the crash case in 1995 with Walt Webb, who had trained under Allen Hynek. They traveled to Santa Rosa to interview the retired X-ray technician, Bina "Beanie" Bean. Rainey wrote that Bean had told local MUFON representatives that in either the spring or winter of 1963, she had been riding shotgun in an ambulance that sped to a crashed saucer site on a remote desert road and returned with severalnon-human little bodies. She'd X-rayed them, she said, and described them in detail. That was when the military arrived and cleaned out every scrap of evidence, threatening the hospital staff to keep their mouths shut. Bean drew maps and named names. But, as Walt Webb wrote to Rainey several years later: "We had only one anecdotal story by one alleged eyewitness to a 32-year-old alleged episode!" Rainey wrote, "In 1997, Budd and I returned to follow-up on the Beanie storywhile in nearby Roswell. I taped Budd's interview with the eccentric Beanie, noticing that she was starting to embroider a great deal around the edges of her original story of a crash retrieval, including claiming her own abduction experiences and asserting that her older sister was the famously elusive nursewho warned off the mortician at Roswell, shortly after that alleged crash." At this point, I would have punched out of the story, simply because, by 1997, I was convinced that there had been no nurse and that Glenn Dennis was being less than candid with us, as I have recently detailed. I probably wouldn’t have had much more to do with the case when I learned that, but according to Rainey, "Neither she [Beanie] nor Budd had tracked down or spoken to any of the long list of possible witnesses. The only glint of confirmation of this single eyewitness's story came during our visit to the elderly widow of the ambulance driver. When pressed, she seemed to vaguely recall that the Air Force had indeed once stripped the ambulance clean and taken the billable trip ticket, as Beanie claimed. But the widow had no idea what year or what decade that might have occurred in." Rainey wrote that when they returned to New York, she had made a short film from the interviews. She thought that "Beanie was quirky and entertaining and I left the validity of the case up in the air." Budd believed the case to have merit and again, according to Rainey, used it in his lectures and seminars. But she was upset that Budd had never attempted to find any of the other alleged witnesses so she began to dig a little deeper into the file. She wrote, "In it were two letters to Budd from Walt Webb, written severalmonths after their 1995 expedition... Webb expressed grave doubt about Beanie's credibility, citing major discrepancies in her stories, told to three separate interviewers." Beanie sometimes claimed there were three bodies and other times there were but two. She said that they had been lined up under a sheet near the wrecked ship and told MUFON investigators that the bodies were hanging out of the craft. In what might be the biggest of the changes, Rainey wrote, "In that same report, Beanie talked of a ‘coroner's inquest’ at the hospital, bringing in people off the street as witnesses; in her account to Webb and Hopkins, she and a Dr. Galvin were the only people present for examination of the bodies. But it wastoo late for such reservations..."
I wanted to know what Walt Webb had to say about this case, and this case only. In an email to me he said that the material about the Santa Rosa UFO crash as published in Rainey’s article was essentially correct. So now we all know a little more about this case. I didn’t think it was very solid based on the little I knew about it, but this seems to have cemented those reservations. Yes, witnesses change stories subtly in each telling but the major features don’t change. You don’t move from three bodies to two, and you don’t come up with a coroner’ s inquest using people off the street. That simply is too much. And I know what you all are thinking. In the Roswell case, there are tales of three bodies, four bodies and sometimes five. But each of those numbers came from a different witness and where one might have only seen three, another might have seen four. If the witness changes the number, then we begin to wonder about all the observations by that witness. I saw some of the same things in the Willingham – Del Rio crash where he changed the date three times, the type of aircraft a couple of times and was unable to provide any documentation for his alleged Air Force career. Here is another UFO crash case that I believe we can eliminate from the listings. It is single witness and there is no corroboration for it. This case can join Del Rio on the list of those explained.